Dive Central Gili is located within Pesona Beach Resort & Spa which offers 25 rooms to suit a range of budgets. 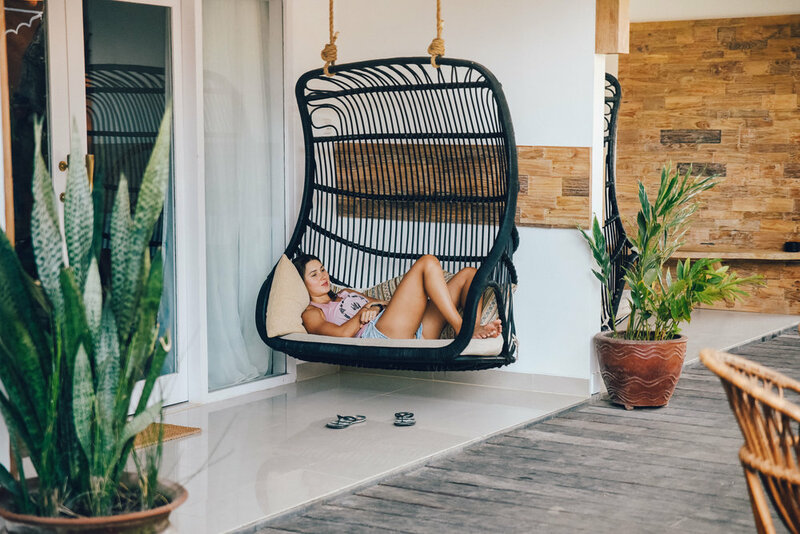 Centrally located near all the main restaurants and bars (including Pesona's popular restaurant featuring fresh western dishes, authentic Indian cuisine and sheesha lounge), boutique shops, and cafés -- the famous Gili T night life is within walking distance. Pesona Beach Resort is an ideal place to spend your time here while diving or simply on holiday. The rooms are set around an attractive garden space with exotic flowers and plants encircling a private swimming pool. Most rooms have their own private balcony, where you can chill in peace with a good book. The front swimming pool overlooks the white sandy private beach and the turquoise ocean, with Gunung Rinjani as its backdrop. We have 6 Room Types of Accommodation available to our guests. All of our rooms are considerately furnished with quality in mind and all have en-suite western standard bathrooms with hot fresh water. Check Pesona Resort availability & prices over your dates and BOOK the room directly from here using a Credit card or Debit card. These newly built rooms face our new 2nd resort swimming pool and tropical garden under swaying palms. 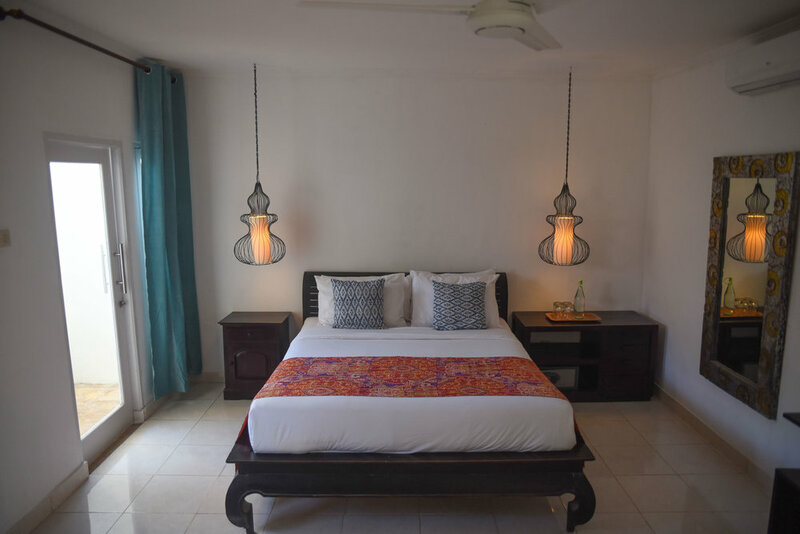 Furnished in reclaimed Java teak with elements of Indian design, these rooms have elegant linens, and luxurious tiled bathrooms with walk-in showers. 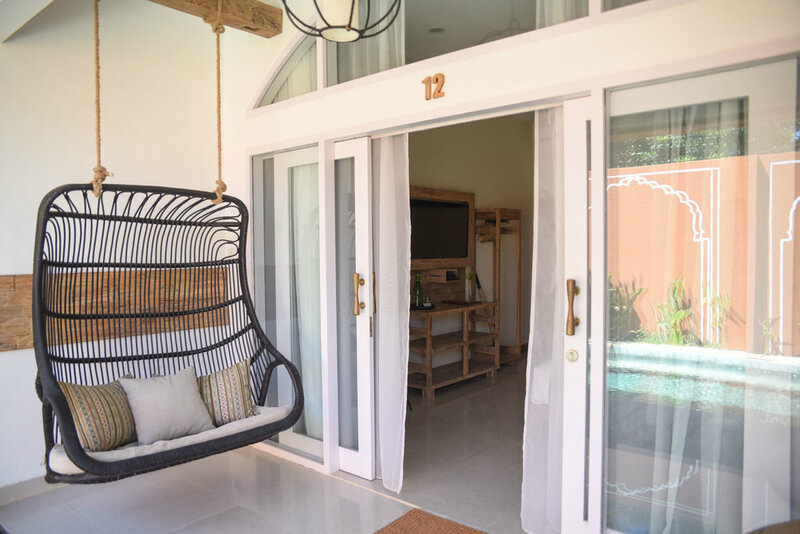 With one king bed, all rooms have glass doors that open directly onto a veranda with rattan swing chair and pool view for the ultimate lazy afternoon. 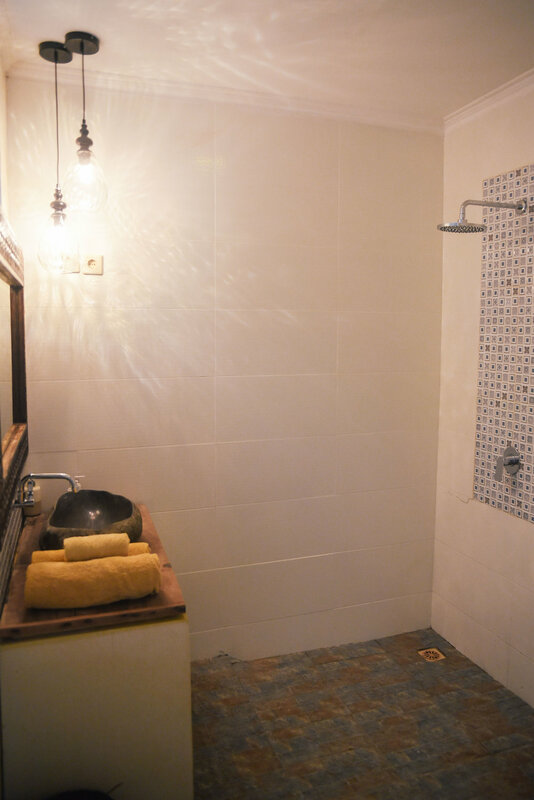 Air conditioning, Hot water shower, along with an in-room safety box. All rooms have a flat screen TV and international cable channels. 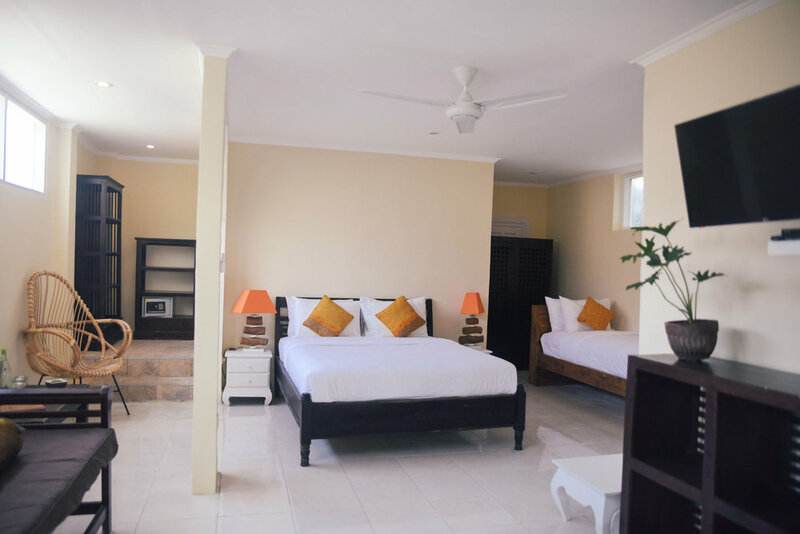 These newly refurbished rooms are situated above the dive centre on the 1st floor with no balcony. 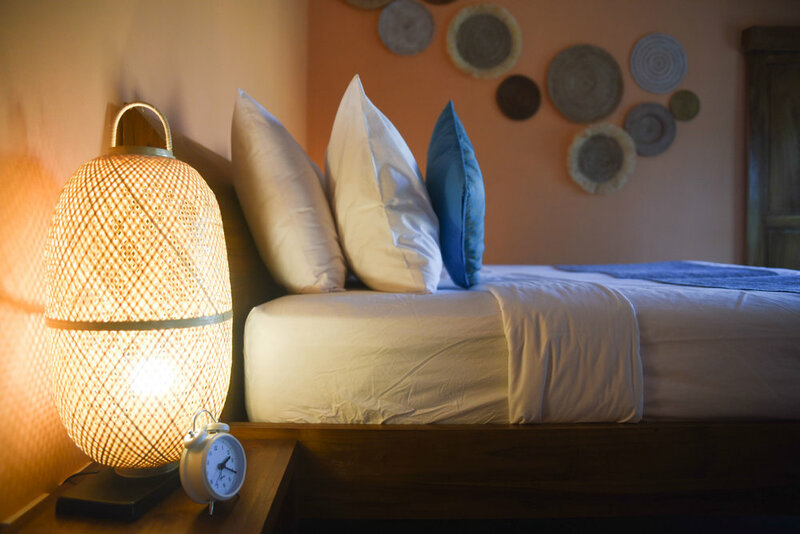 Each room is beautifully furnished with 2 single beds (that can also be made into a king), reclaimed teak furnishings, air conditioning, hot water shower, TV, international cable channels, and a safe for your valuables. These large rooms with balcony are situated on the 1st floor above the Dive Centre overlooking the ocean with perfect views of sun-rise, Lombok, and Rinjani. 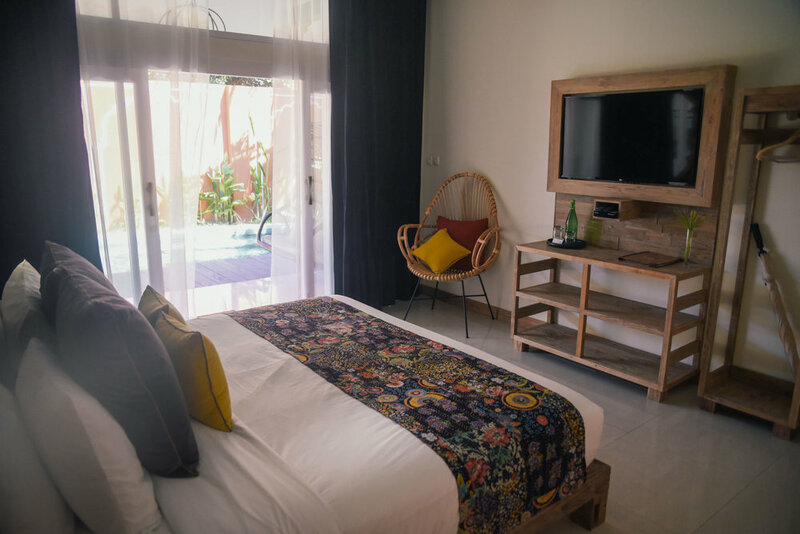 Each room is beautifully furnished with 3 single beds (that can also be made into a King and daybed), reclaimed teak furnishings, air conditioning, hot water shower, TV, international cable channels, and a safe for your valuables. This pool view room is situated on the ground floor facing the 2nd swimming pool at the heart of the resort. It is available on it’s own or as connecting room with the Large Room with Balcony for groups. In addition to 3 single beds, this room has Air-Conditioning, a large flat screen TV, International cable channels, fresh hot water shower, and a safety box. 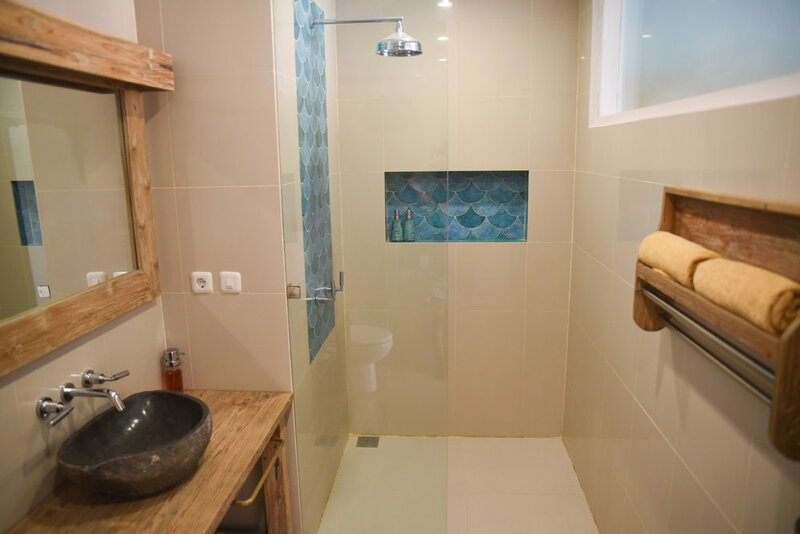 This room is located at the rear of the resort and is perfect for guests looking for a bit of privacy. The air-conditioned bedroom has 3 single beds (can also be made into a king) a large bathroom with hot water shower, and 2 private terraces. 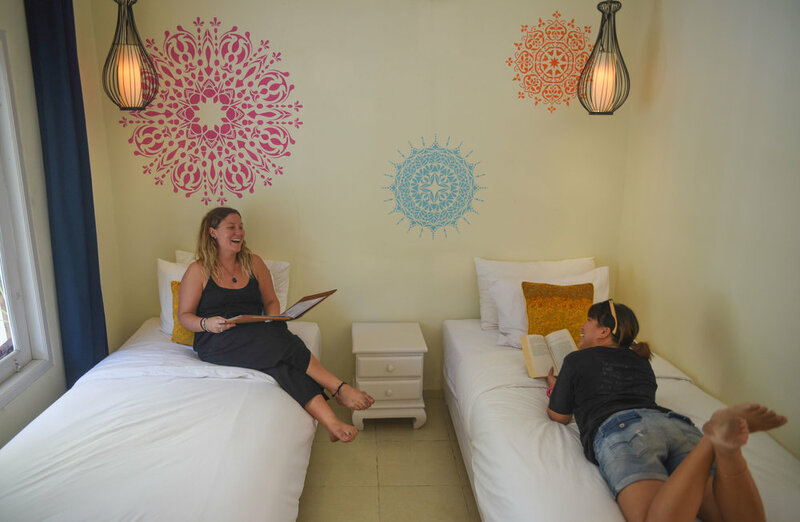 These rooms located on the 1st and ground floor making it ideal for friends travelling together who want to be close to each other. Al these rooms have a private verandah furnished with comfortable sitting area and lots of lush greenery. 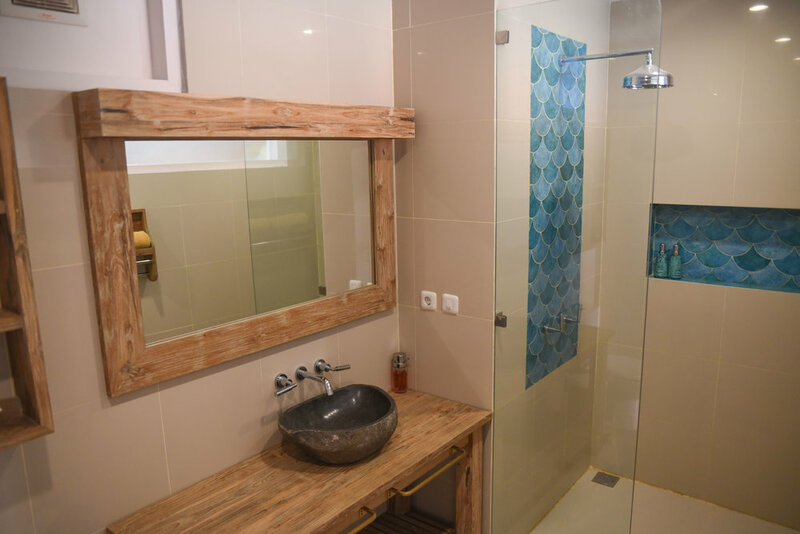 Built in 2009 and refurbished in 2018, these rooms have western bathrooms with hot fresh water, Air-conditioning, king koil beds, flat screen TV with International cable channels and a safety box for your valuables.